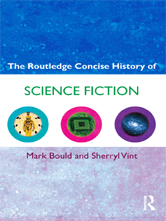 The term "science fiction" has an established common usage, but close examination reveals that writers, fans, editors, scholars, and publishers often use this word in different ways for different reasons. Exploring how science fiction has emerged through competing versions and the struggle to define its limits, this Concise History: provides an accessible and clear overview of the development of the genre traces the separation of sf from a broader fantastic literature and the simultaneous formation of neighbouring genres, such as fantasy and horror shows the relationship between magazine and paperback traditions in sf publishing is organised by theme and presented chronologically uses text boxes throughout to highlight key works in sf traditions including dystopian, apocalyptic and evolutionary fiction includes a short overview and bullet-pointed conclusion for each chapter. Discussing the place of key works and looking forward to the future of the genre, this book is the ideal starting point both for students and all those seeking a better understanding of science fiction.